Taco Grill — purveyor of sustainably sourced meats and exceptional pozoles in Oakland’s Fruitvale neighborhood — has moved across the street, as first noted on Chowhound. The casual taqueria, which is now called Obelisco, took over into the space formerly occupied by Mar y Tierra (3411 E. 12th St., Ste. 110), another Mexican restaurant. Perhaps you, like me, have occasionally had a hankering for a rice bowl from Hawker Fare or a margherita pizza from A16, but felt too lazy to leave your house — to deal with parking, or waiting on line for a table during the peak dinner rush, or any of the other hassles that go hand-in-hand with a formal restaurant dining experience. If so, Caviar, a delivery service for sit-down restaurants, most of whom don’t normally deliver, might be the solution you’ve been waiting for. Founded by four UC Berkeley alums, the company launched in San Francisco two years ago, and has slowly rolling out its service to other major cities. Caviar just launched service in the East Bay yesterday, with a preliminary lineup of fifteen restaurants that includes some of the most popular and most beloved spots in Oakland and Berkeley: Hopscotch, Phil’s Sliders, Plum Bar, the aforementioned Hawker Fare and A16, and many more. The Sunday Supper — a prix-fixe meal served on what is traditionally a slow night in the restaurant business — is seeing somewhat of a revival in the East Bay. Charlie Hallowell (Pizzaiolo, Boot and Shoe Service, Penrose) is the latest restaurateur to launch a Sunday Suppers series — one with a philanthropic slant. The idea is simple: For the next year, on the third Sunday of every month (except December), a prominent East Bay restaurant will host a $100 multi-course, prix-fixe dinner. Two-thirds of the proceeds from each dinner will go to a selected local nonprofit organization. So, with two 75-person seatings, each sold-out event represents a $10,000 donation. 1) There’s another new destination for coffee fiends in Uptown Oakland: Coloso Coffee opened last month at 1715 Webster Street. 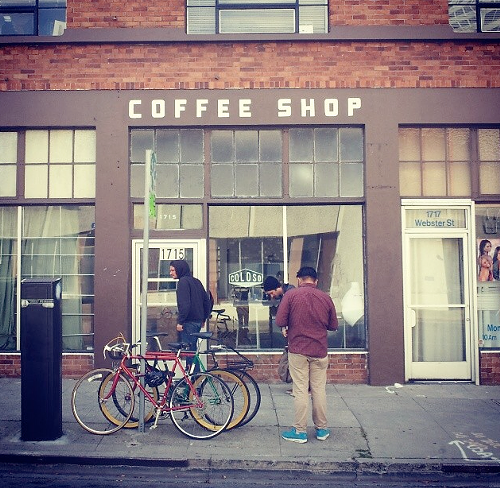 Owners Jose Posadas, Renzo Gianella, and Maggie Servais are serving Sightglass drip coffee and espresso drinks, as well as a small selection of pastries from San Francisco’s Sandbox Bakery (they of the excellent croissants). The cafe eventually plans to start roasting small batches of coffee in-house as well, importing the beans from a coffee farm in Peru that Posadas’ brother owns. How often does the trombonist trade in the slide lubricant and spit valves of his main trade for the siphons and bottling buckets of the home brewer? How often does the oboist set aside her handcrafted reed to take up the ancient art of winemaking? Perhaps more often than you’d think. For years now, several members of the Oakland East Bay Symphony (OEBS) have spent their off hours doing just that — creating homemade brown ales and setting up garage wineries. On Saturday, May 17, from 6 to 9 p.m., members of the orchestra will be sharing their imbibable creations with the general public, in a first-time event they’ve dubbed “Bach & Brew.” The event, a fundraiser for OEBS, will take place at the Linden Street Brewery (95 Linden St., Oakland), where attendees will have the opportunity to sample an assortment of beverages that can’t be purchased in any liquor store — all of them created by the orchestra’s “musician-brewmasters” and “musician-winemakers” — as well as some craft beers by Linden Street head brewmaster Adam Lamoreaux. Like a favorite son come home, Charlie Parker — the opening chef at Plum — has returned to Oakland. Daniel Patterson's restaurant group announced via a press release sent out early this morning that Parker, who presided over the Patterson-owned Uptown Oakland restaurant's early heady days in 2011, will start today, May 5, as the new executive chef at Haven (44 Webster St.), Patterson's Jack London Square restaurant. Parker's most recent gig was at Freddy Smalls Bar and Kitchen, in Los Angeles.